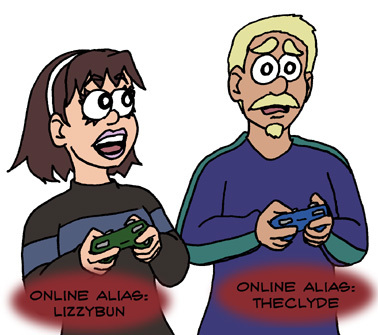 Clyde & Lizzy: The Quintessential Everycouple. Still in the early stages of marriage, our protagonists struggle to find quality time together amid an endless stream of video games. Energetic and unabashedly vociferous when she needs to be, Lizzy is the dynamic lead of this comic, supported closely by her husband, Clyde. Clyde is easy-going and patient, a complimentary counterpart to Lizzy. Lizzy can spot a game she likes from a mile away; Clyde is much more generous in his approach to new games. When in the real world: Clyde can usually be found in the vicinity of fruit-flavored candy; Lizzy will sleep through the noon hour. Trapped in a complex virtual reality (with the occasional day-off), Lizzy & Clyde continue to make the most of their situation. At least they don't have to pay for all the games they play. Weasel : The Self-Proclaimed Lord Of Gaming. Weasel is definitely the type of gamer you want on your deathmatch team. Otherwise, you’ll never hear the end of it if he frags you. Weasel specializes in shooting monsters with way too much ammunition, and bragging loudly about his “awe-inspiring” saves. Weasel enjoys annoying Lizzy, but she puts up with him because he's the one that's responsible for Lizzy and Clyde meeting. Always the follower, Chrome takes the supporting role in all games, never feeling the need to lead. Chrome enjoys Japanese Pop music and a nice Chianti. Chrome is the goofball of the group, and the most likely to get distracted by shiny objects. 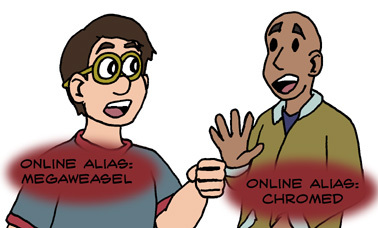 Weasel & Chrome enter the virtual gaming world as playtesters for an expensive, top-secret technology.